Semtech Corporation (Nasdaq: SMTC), a leading supplier of analog and mixed-signal semiconductors, won the NewBay Best of Show Award from TV Technology at the International Broadcasting Convention (IBC) 2016 for its newly-announced UHD-SDI retiming cable equalizer and cable driver for next-generation UHD and HDR applications. The award was announced at IBC on September 12. The GS12090, announced and demonstrated at the IBC show last week, is the industry’s highest performing, configurable 12G UHD-SDI cable equalizer/cable driver. It is ideally suited for use in applications with limited space for connectors, including broadcast video servers, modular I/O cards, PCIe cards, portable recorders and players, and more. This is the second award this year for Semtech from TV Technology. 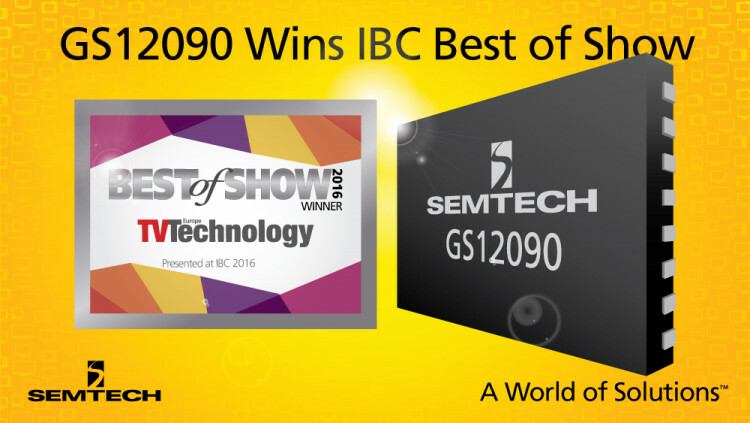 The GS12070 UHD-SDI Gearbox won the same award at the NAB Show in April. TV Technology uses a panel of industry experts to judge nominated products based on design, features, cost efficiency and performance. The GS12090 will be available for sale the second half of 2016. Semtech offers comprehensive design assistance, including field- and factory-based support. Data sheets, volume pricing and delivery quotes, as well as evaluation kits and samples, are available at www.semtech.com/info.